Day 1 of the first ever Brazil Masters - I am not surprised by the poor size of the crowd due to the absence of top players like O'Sullivan, Williams, Higgins and Trump. The tournament opened with Mark Selby versus Stuart Bingham - competition between the last two ranking winners. Bingham won the first two frames to lead 2-0 before Selby managed to recover with 82 to lead 3-2. 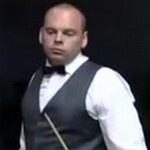 Bingham levelled 3-3 to force a decider. However, Selby was still the eventual winner of the match. He won the decider with 41 and 31. What a comeback from the new world number 1. Bingham wrote on Twitter: What a wally! That what happens when you dont take your chances against the worlds best! Great to be invited, would've been nice winning though! It was an exciting match but shame that many seats were empty. 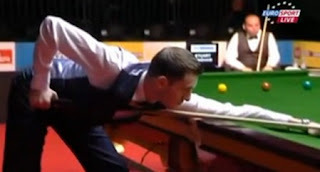 There was an issue that once worried the players - the match table finished set up just a few hours before the first match Selby v Bingham was up. The players were panic about they would have no where to play on. The problem was solved fortunately. I am not sure if Selby's next match will be welcomed by the fans. Because The Jester is going to play Peter Ebdon who saw off Stephen Lee 4-1 with 41 and 31. The crowd was better when their local man Igor Figueiredo was playing. And the Brazilian did not disappoint the crowds. Igor Figueiredo beaten Jamie Cope 4-2. Fugueiredo lead 2-0 up with 56 and 41 before Cope pull one back. Fugueiredo made 74 to lead 3-1 before Cope won one more. Fugueiredo ended the match with beautiful 114 to win 4-2. Great win for Igor the only pro player from Brazil. I would love to see him going back to play in England next season with sponsor. Graeme Dott was the last match winner in the first day of Brazil Masters. Dott took the victory 4-1 over Mark Davis with 73. Dott will play Igor Fugueiredo in the quarter-finals.